Elliott Takolu (left) had held a dream for a very long time. Having fallen in love with the game of Australian Rules football back in his home city of Lae in Papua New Guinea, Elliott always wanted to get to Australia and try his luck. After many failed attempts to get to Australia, usually through visa issues, Elliott finally made it this year. Even though he arrived well into the new season, he joined AFL Cairns club, the South Cairns Cutters. Living with a host family, Lance and Sue Dixon, Elliott finally played out his dream. Cutters’ president Steven Begg was high in praise for Elliott’s commitment to the game and the club, as well acknowledging him as a fine young man. Steven was impressed in equal parts by Elliott’s attitude and application to his footy as well as his work off the field helping club and family in any way he could. It is this combination of ground-breaker and role model which Elliott will take back to Lae and use to inspire others to make the jump. So Elliott has taken that first step and reached the playing fields in Cairns. With Willie Aisi, fellow Papua New Guinea player and member of the PNG team which just won the International Cup in Melbourne, currently playing in Cairns for the North Cairns Tigers, as well as others in recent times scattered across the nation, the trickle of PNG talent is starting to grow. 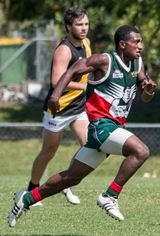 A pipeline of talent from Papua New Guinea and other Oceania nations has been quietly discussed and worked on in the halls of AFL Cairns for some time, not to mention the discussions at AFLQ in Brisbane or the hallowed halls in Melbourne. It certainly makes sense. Cairns’ profile has been raised in recent years as an AFL destination through the playing of matches featuring the Gold Coast Suns, Richmond Tigers and the Western Bulldogs. Cazalys Stadium has been extensively developed to be a hub for football in Cairns, and the AFL Cairns competition is well placed to accommodate any influx of talent from nearby nations. As a product, Cairns would hold appeal and its location places it closer to most Oceania centres, but just a hop, skip and jump from Port Moresby and Lae. Local clubs in Cairns are already openly discussing their options for a player market into the future. Established clubs are always on the lookout for talent to be infused into their lists, and access to top quality players from PNG would achieve that goal. Newer clubs on the block can see the value also. Pyramid Power, currently without a senior men’s team, would be a a great position to attract talent. The new Cape York Eagles team, whilst only a junior club at the moment, is keen to be seen as more than an indigenous team and move towards a wider multicultural representation according to their Program manager Rick Hanlon. Younger players in the 14-16 age groups might find opportunities through the Eagles en route to bigger things. Another terrific part of Elliott’s time in Cairns was the donation of a set of jumpers by South Cairns Cutters for the players at Port Powers in Lae. Last year we reported the donation of a set of jumpers to this club by the Baulkham Hills Hawks, assisted by the strength of Pyramid Power’s Brother Clubs Project. Now the South Cairns Cutters, through the generosity of Lance Dixon and support of their president Steven Begg have added further to the trend of lending assistance to clubs in need across the world. The gesture also lends itself to the ongoing symbolic union between Cairns based clubs and clubs in Papua New Guinea. 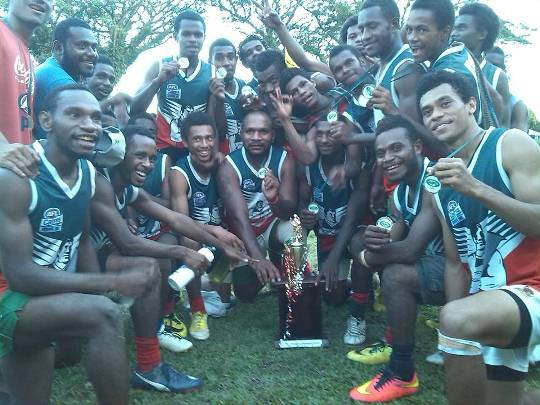 (Left: Port Powers players from Lae wearing their Cutters' jumpers and celebrating their premiership win). Last year the Lae based club went into their finals wearing the Hawthorn colours of Baulkham Hills. This year they won the premiership in South Cairns colours. Currently they use both sets of colours within their club. A year ago the club had no jumpers at all in any age group. The generosity of South Cairns and Baulkham Hills has forever changed the visual landscape of the game in that part of Papua New Guinea, as well as attracting more players to the game as a more “professional” look is cultivated locally. Elliott is not the first Papua New Guinea player to come to Australia to fulfil a dream. Nor will he be the last. But just now he stands as an example of players willing to pursue whatever avenues they can to expand their potential pathways to Australian Rules football success. He is currently walking along that pipeline, leading the way as others begin to follow. And that can only be good for the game.